Well, it’s been two weeks since the race, and everything has settled in by now. From the top, I will say that I am neither disappointed nor satisfied with my results. Lots of factors came into play, some of which were beyond my control and others not so much. At the end of the day, though, it was a great experience that I got to share with some pretty amazing people. The day before a big race, I like to be off of my feet as much as possible and stick to a pretty defined schedule for eating and drinking. Looking at the race guide, I knew that was going to be pretty much the opposite of what would happen. In the morning, USAT had an event, so we went to that. It was low key, but it still took some time going to the event and returning home, meaning more time on the feet. At about noon, we attended the pre-race briefing, where we received information that conflicted with how things would be at bike check-in and on race day. No biggee, as we had time to adjust, but it was a bit annoying. After the meeting, we headed over to T1 for the bike and gear turn-in. 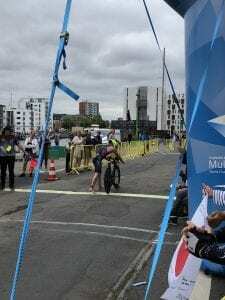 Despite the misinformation campaign by ITU officials (ok, that may be a bit harsh, but it felt that way), the volunteers got us sorted out and helped allay the confusion. Once we got the gear turned in, we made our way to the swim course preview. I chose not to get in, but four members of our group did, so we waited for them to do the 500-yard swim. Boy, was that interesting! Normally, there is very little drama at the pre-swim. Today was a bit different. In fact, it was drama, intrigue, and secrecy! Ok, that may be a little over the top, but it was definitely interesting. 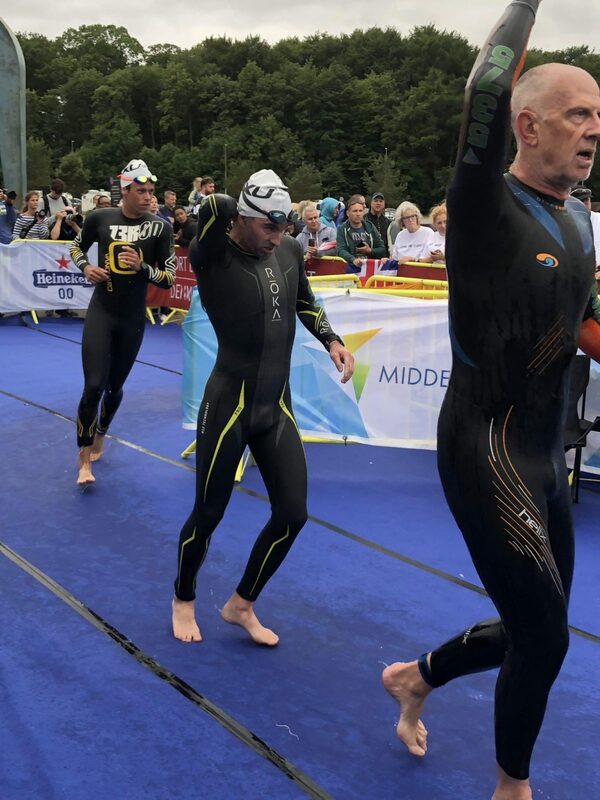 Prior to the other members of the group exiting the water, another swim exited and stood for a second speaking to the race official at the exit. As he peeled down his wetsuit, a roughly 16-inch lamprey eel feel off of his wetsuit. After a little freaking out and discussion whether the eel was inside his wetsuit, everyone agreed that it had likely just attached to his wetsuit. Still, that’s not something you want to think about when doing the open water swim. We collectively made the decision to not say anything about the eel to those in the group who were not aware of the event. The jellyfish were disconcerting enough for them. After finishing up at the swim course, I swung by the expo before heading back to the house. At the house, we chowed on some pizza and got everything prepared for the next day. So, race morning started off great. I ate my breakfast and took care of the “morning ritual” with plenty of time to spare before heading to set up T1 and start the race. Everything was going swimmingly until I realized that I had left my second bottle at the house. Now, this wasn’t that big of a deal, as I normally don’t put a second bottle on the bike and pick one up at the first aid station. However, with the new setup, I had not had the opportunity to practice putting my replacement Skratch Labs powder in the BTA aero drink. I thought the second bottle would preclude that necessity, and I am sure it would have. Ok, no biggee. I then went looking for the plethora of porta-potties that would be at the starting area to pee one more time before heading to the swim start. Interestingly enough, I only found a couple with really long lines. Now, I’m not a math wizard, but for a field of about 1500 athletes, including the Aquabike and Long Course triathlon, one would assume that more than five bathrooms would be necessary. Apparently, that was not the thought of the organizers. Since I only needed to pee, I decided to hold it until I got in the water. About 15 minutes later, my wave was finally permitted to get wet. Man, that pee felt amazing! 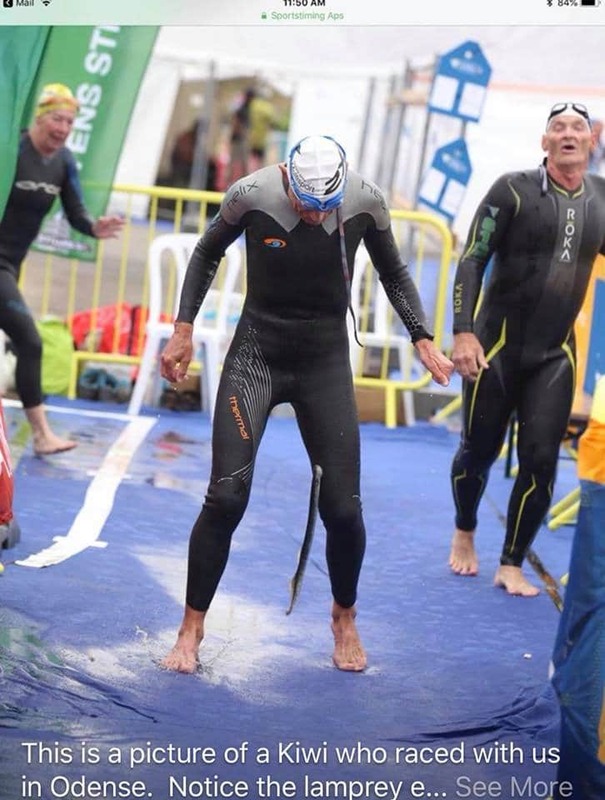 As normal, I did not seed myself at the front of the swim. In fact, I found that most people were doing a good job of spreading out to limit the aqua battle that normally occurs in the first few hundred meters. Unfortunately, the collective wisdom of the group was destroyed by a slight tidal current and a picky starter. The starter kept telling the front row to get behind the buoys, and from my spot in the third row, it looked like they were. The starter disagreed and kept waiting. During this interminable wait, the slight current kept pushing the swimmers in the back closer to the front, creating a tight bait ball of swimmers. After we were sufficiently packed together to ensure a proper fight, the gun went off. Boom! Oof! Those were the first two sounds of the race for me. The first was the start, and the second came as I took a foot to the nether regions. Not the best way to start the swim. The next 3000 meters really didn’t get a whole lot better. I made the second group, so I was sitting pretty on some good feet. The problem with that was the leaders of our group got slightly off course. I was smack in the middle of a tightly-packed group of about 25 swimmers. There was absolutely no way to cross the group and stay on course without having to get into some serious fisticuffs. We really weren’t that far off, and it was not really to our advantage to be off course, but the safety kayakers put up a Maginot Line. We ended up taking a hard right turn to get back to the outermost buoy and get back on course. Not a big deal, but it cost us a little time. From there, we rolled through the mid-point exit and re-entry before making the long swim back to the exit. Honestly, the water wasn’t too bad, and the jellyfish weren’t too much of a bother. They were everywhere, don’t get me wrong, but I only got stung on the toe once. As for the eels, I didn’t collect any, but some folks did. Tell me that wouldn’t freak you out! I guess I can’t say whether I had any or not, as I just started running to T1. I am sure the jostling would have knocked them off right away. Either way, I didn’t notice any. I also did not get attacked by a shark, so there is another positive. I have to take those positives because my swim was about three minutes slower than I wanted. There were still a ton of bikes in transition, though, so I wasn’t too upset, just a bit perturbed. I ripped through T1 as fast as my cold hands would allow, grabbed my bike, and did my typical flying mount. Here’s the thing, it didn’t go as planned. Remember when I talked about having to get a new bike a week before the race? Yeah, apparently, the one flying mount I practiced was not quite enough to do it at full speed, wet, and a little cold. I didn’t quite hit the saddle correctly, carrying to much forward speed and making contact with the front portion of the saddle instead of the middle. I slid off the saddle but caught myself before the top tube could give me another nether region smack. Whew! That was close. About a mile later, I realized that it was much worse than just a crotch hit would have been. No, the errant mount dropped my saddle about three millimeters and tilted the nose slightly downward. The saddle change was completely my fault, as I had not torqued down the seat clamp enough. Thus, I found myself not able to reach full extension on my pedal stroke and slowly sliding forward for the entire ride. Awesome! Not much I could do about it, though, as I never saw the mechanics on the road. So, I just sucked it up and rolled. The bike course was a pretty one, and it had just enough terrain changes to make it interesting. I spent much of the first lap passing folks, which doing so legally was a bit different than in WTC races. 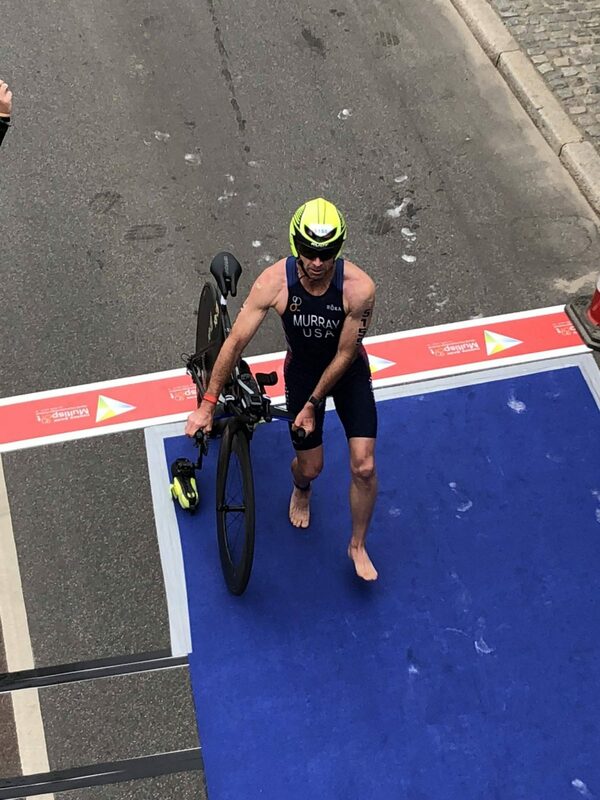 I was thankful to the Endurance Lab workouts for my ability to make the necessary surge and recover, as crossing 12 meters in 30 seconds is no joke when the rider being passed would rather not be. While I did a bit of passing, I was passed by a few folks. Notably, I had a handful of local racers pass me in what could only be described as a Team Time Trial fashion. The worst part of it was the race official who saw it and did nothing. That was a little disappointing. Other than that, I had a lot of fun on the bike. I was near a couple of Japanese riders for a while until one overcooked a turn and went off into someone’s yard. Thankfully, he stayed upright, but I never saw him again. I can only assume that he got a lot more conservative after that. Overall, I had an above average ride. I ended up dropping my gummy chews early in the bike, so I was a bit short of my intended caloric intake, and I had to switch to gels much earlier than anticipated. As I approached T2, I didn’t feel any hunger, but I definitely felt that my hands were very cold. That would make putting on my socks and shoes interesting. Anyway, I pulled into T2 and handed my bike to a volunteer, grateful that I did not have to rack it. I threw on my socks and shoes, grabbed my hat and race belt, and went looking for a bathroom. I had to pee! Normally, I advocate just peeing on the bike while riding. However, the urge to pee did not come about until I was only a few miles from T2. I figured that I would just go in one of the many porta-potties that would be in T2, as described by the ITU officials at the pre-race brief. (At some point, I need to stop believing those people.) I asked to be directed to the bathroom, and I was directed out of T2. No problem, I thought, the race officials briefed that there would be bathrooms at every aid station. I can hold it for a mile, no big deal. Yeah, I finally found one at KM 6, so most of the way done with my first lap. Not my favorite way to do things. Why didn’t I just swing off and pee on a tree, you ask? Well, I tried and got told by a race official that I had to use one of the designated bathrooms at aid stations. When I told her that there were not any, she just shrugged. Back to the running and less pee talk. As a result of my flying mount-induced new bike fit, my achilles tendons were none too pleased to get out on the run. I pushed for the first mile, trying to loosen them up, before backing off and focusing on my bathroom search. By lap two, they had started to loosen up, but I could never get a good rhythm going. I felt that my stride was just not there, and I couldn’t really push out the back too much. I kept the pace at around 7:15 per mile and fueled as much as possible at each aid station. I took some time to stretch a little as I walked through the aid stations, but I tried not to give back too much time. Over the last two laps, I kept at it, slowly opening up my stride and getting a little bit of speed. By mid-way through lap four, though, I was spent. My inability to take in enough calories on the bike and switching early to gels left me hard-pressed to take in enough calories on the run. Let me tell you, I couldn’t stomach the idea of eating my last two gels. I ended up taking in some cola and some banana to try to get some fire back in the engine, and it helped a little. I did notice that my strategy of walking and fueling at the aid stations was starting to pay off. A couple of people in my age group who had passed me earlier in the run were now coming back to me. Because they weren’t fueling or at least I didn’t see them fuel, they began fading pretty significantly. With about three miles left, I slowly started reeling people back in and picking them off. I’ll be honest here. I made a conscious effort to obscure the wristbands on my forearm that denote how many laps I had run. I wanted the people to think that I was a full lap behind and not just passing them. I’m not sure how it worked, but nobody whom I had passed came back to me. I made sure that every pass was done well before an aid station to ensure that I could put distance on them. I know, it sounds silly, as we weren’t fighting for the podium at that point. We were, however, fighting for positions in the top ten! In the last mile, I made a strong move on the last guy in my age group whom I could identify. He had nothing left in the tank to respond, and I blew through the last aid station. I figured that it was time to make it on sheer determination. Damn the torpedos! Full speed ahead. Ok, let’s not kid ourselves, full speed was not even cracking a seven-minute mile pace, but the attack worked. Going up the last hill, I put enough time on him that I was able to grab a flag and cruise through the finishing chute, soaking it in the whole way. Overall, I would say that I did a fair job at race execution. 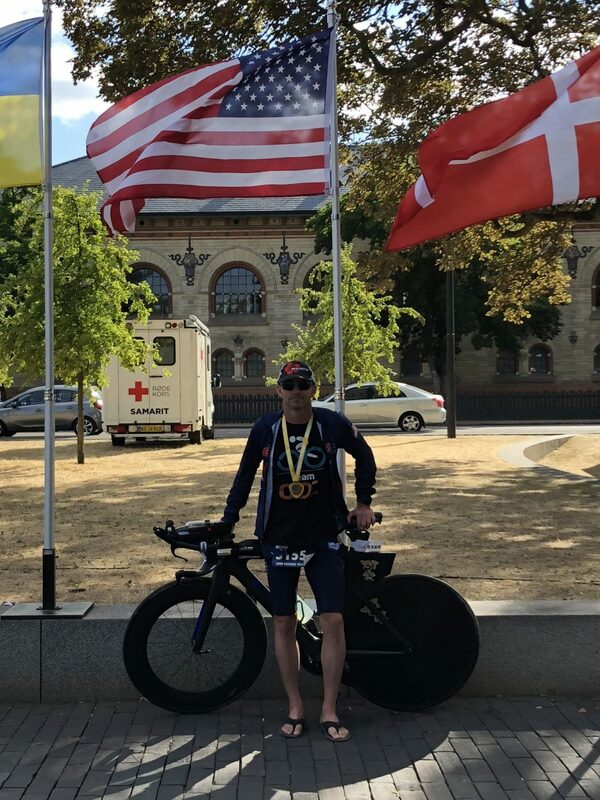 When I consider all of the challenges associated with moving, travel for the six weeks prior to the race, and getting a new bike the week before, maybe it was better than fair. I did have a great time with our group, and I was able to finish 7th in my age group and 33d overall (top 8 percent). I’ll take those results for a world championship. I do have to say that my training on Zwift really did get me ready for the race. 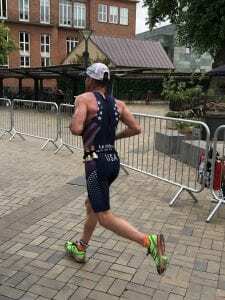 Had I not had all of the other chaos prior to the race, I am sure that I would have been able to go a good bit faster, but that wasn’t in the cards this time. For the data nerds out there, I completed the race in roughly 6 hours and 38 minutes. I swam just above 54 minutes for 3000m. I held a NP of 201W for the bike for an IF of .8 and averaged a little over 22 MPH for a time of around 3:22. I also burned about 2300 calories according to TrainingPeaks. I ran the 30K in 2 hours and 22 minutes for an average of 7:44 per mile. I used my Stryd on the run which gave me an NP of 230W and about 1300 calories burned. The total TSS for the day was 466. Well, I just finished my move… sort of. We’re still waiting for our stuff to be delivered, so no Zwifting for me for another week or so at least. But, I am signed up for the Nations Escape Tri here in Washington, DC. It’s an Olympic-distance tri, so I don’t have to put in crazy amounts of time for the training. I do need to get my speed back… and drop some of the pastry and beer weight that I acquired in Denmark. Thanks to all of you who followed me through this long journey, and I hope to see you soon out on course. Maybe I’ll even get to ride the new Innsbruck course soon. Woo hoo! Until then, Ride On! Ian, congrats on the great AG placing and thanks for having shared all the regular training updates. 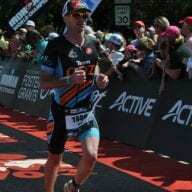 I’ve been following along most of your journey (tracking your progress on race day), and the series has really kept me motivated in my Tri training. 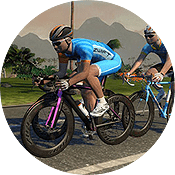 Hope you’re well recovered and see you around Zwift! Ryan, thanks! 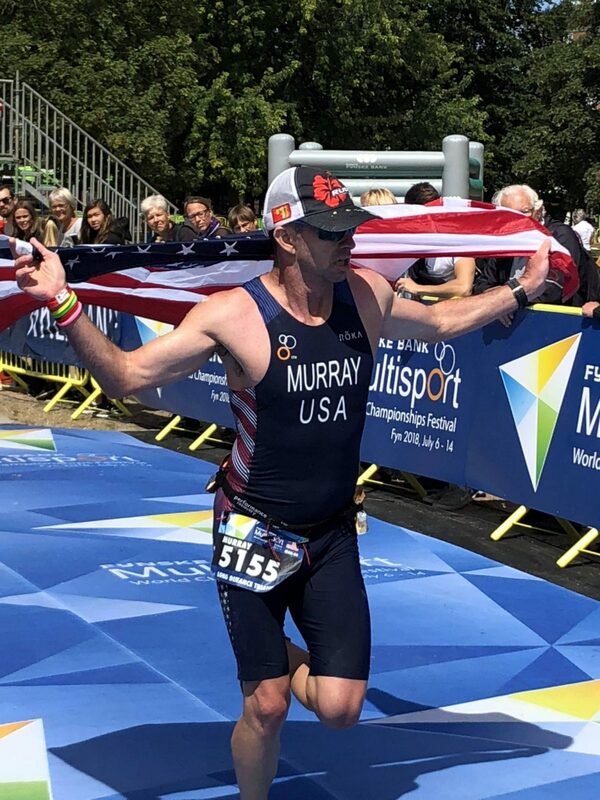 I have recovered nicely from the race and am training up for the Nations Escape Tri in September here in Washington, DC. It’s nice not having to train long for a change and hammer out some hard intervals.